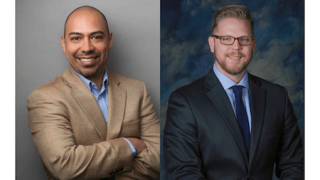 Joshua Beltran (left), and Michael Hooper Biamp Systems has appointed Michael Hooper as area manager for North Texas, a position previously held by Joshua Beltran. Beltran has accepted a new position as software product manager and will be based at Biamp headquarters in Beaverton, OR, reporting to Shell Haffner, director of product management. Beltran will focus on developing and managing the company’s family of control software. Hooper will be based in Dallas, reporting to Mark Wentz, South Central regional sales manager, and will work to develop and expand Biamp’s sales opportunities and channel relationships throughout the North Texas region. Hooper joins Biamp from Mizzen Marketing—an independent professional AV manufacturers’ representative firm serving Texas, Louisiana, Oklahoma, and Arkansas—where he served as regional manager in charge of building and maintaining relationships with key regional clients. Prior to that, Hooper was a technical supervisor for audio, video, and production communications for the Dallas Center for the Performing Arts (now known as the AT&T Performing Arts Center), and was also the director of operations for three Texas-based professional symphony orchestras. In his previous role as Biamp’s North Texas area manager, Beltran oversaw all sales efforts and installations in the North Texas, Oklahoma, and Arkansas territories. Prior to joining Biamp in 2013, he was an AV designer for Wrightson, Johnson, Haddon & Williams, Inc. in Dallas, where he grew sales for existing and prospective clients and designed AV systems, sound reinforcement systems, and digital media systems. Beltran also previously served as field operations manager and senior project manager for Covenant Communications Corporation in Houston, managing all design-build technical sales.